Sanding is very important job in the finishing process. The fact is the sanding job is half of the finishing work, while the other half is the application of finishing materials. A good sanding process is absolutely needed when we make high gloss finishing with thick layer film built. The proper sanding is needed to the finish layer every time we are going to layer it with another coat. There are 2 sanding methods in the finishing process, the dry sanding and wet sanding. The dry sanding is the sanding when no liquid is used; the heat arisen in the sanding process is addressed by the sanding agent in the sanding paper. You can view about it in our previous article: the sanding to the sealer and top coat. The wet sanding is sanding technique that uses liquid to absorb the heat arising during the sanding process. 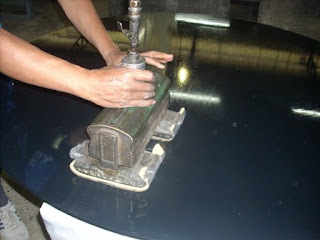 The wet sanding is more used in the finishing process for car refinishes or finishing on the metal products. The wet sanding for wood finishing is rarely used, but sometime we need to do it. Wet sanding is needed when the thick and smooth finish film with high gloss finish is built. 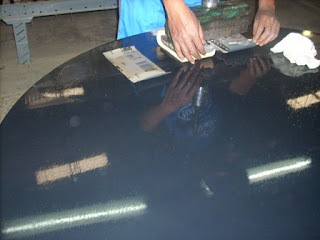 Wet sanding is also done as the first process in the rubbing and polishing. Wet sanding is generally considered as more complicated process because it deals with the liquid, but it can produce a more smooth and even surface. A finishing process with PU or AC may need the wet sanding to prepare the finish layer before the final coat. The wet sanding is able to produce a smooth surface with less sanding mark, and then a thin layer of last coat can be layered on without any obviously sanding marks. The wet sanding can minimize the problem of sanding mark and orange peel at the high gloss finish. The wet sanding should be done at the finish with thick film. The thin finish can be sanded with stearated sandpaper as well. The wet sanding at the thin film layer is risk to get the problem caused by the liquid penetration into the pores and grain of the wood. Wet sanding usually is done after the wood surface has been layered by 6 coats of coating or more. The wet sanding can be done as a final sanding to provide a smooth and even surface before last coat or as the first step in the process of rubbing. Make sure the coating layer is completely dry when do the wet sanding. The wet coating film will be loaded at the sandpaper and risk to cause deep scratches in the coating layer. The drying time of the finish is varying, depend to the coating type. The NC, AC, shellac, furniture varnish and water based usually are completely dry after 24 hours, while the indoor PU needs about 1 day or 2 days to dry. The outdoor finish such as spar varnish or outdoor PU need longer time to dry. 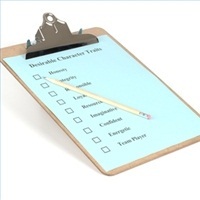 The materials and tools needed. Wet sanding is only done at a flat section when the surface finishing requires perfectly smooth and even surface. The top table or top panel from the cabinets are the subjects to the wet sanding since they are the main focus of intention of the furniture product. While the other part such as: chair, leg, side panel, and drawer don't need the wet sanding. The small imperfectness at the complex and uneven surface will not so obvious. The wet sanding at the complex form is also very difficult at the workmanship. The wet sanding should be done using sanding machine. The double pad sander machine is an ideal tool to do the sanding for the big surface, while for small surfaces the hand block can be used. We need the waterproof sandpaper or the wetor dry sandpaper. It is the sandpaper with the backing and glue that are resistant to the liquids. The waterproof sandpaper is available in a very coarse with (# 1 grade) to the finest (# 2000 grade). In the wood finishing usually we use the sand paper grade from # 800, to # 2000. It is a liquid that serves to absorb heat arising from friction between the coating with the sand paper. The liquid is also helping the sanding process by sleek the finish surface and hold the sanding dust. There are some liquid can be used. Some finishing materials supplier company has provided a kind of oil as the sanding liquid under some different names such as: cutting oil, rubbing oil or rubbing lubricant. If the cutting oil is not available, we can use the mineral spirits with small amount of wax or water mixed with soap. How to do the wet sanding. The wet sanding is about the same with the dry sanding but we have to wet the surface with the sanding liquid during the sanding operation. Keep the surface is always wet when we do the sanding. Put the sandpaper at the sanding machine pad and then move the machine in accordance with the wood grain consistently to the entire surface. Start the first cutting with the coarse sandpaper (grade 600 or 800). Do 2 or 3 strokes sanding with the machine and then dry the wet surface using dry cloth, and check the result. Watch and observe the sanding result. The sanding is stopped when the surface has well sanded with all orange peel has been truncated. If the orange peel and uneven surfaces still exists then we have to repeat the sanding. If we do wet sanding as a preparation to the final top coat, the sanding with the # 600 or # 800 grade sandpaper is enough. We can continue sanding with the finer sandpaper when we want to do rubbing and polishing to make high gloss finish. 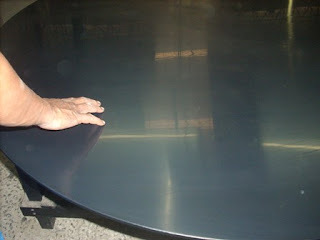 You can view it at our previous articles: rubbing and polishing.